Home / Aaron Burr Sr. Upon Jonathan Dickinson’s death, the College moved to the Newark parsonage of his friend, Aaron Burr Sr., who was formally elected president a year later in 1748. During the period Burr was Princeton’s president, a curriculum was devised, the student body increased tenfold, and the College’s permanent Princeton home was established. Burr presided over the first Commencement exercises in his Newark Church (November 9, 1748). 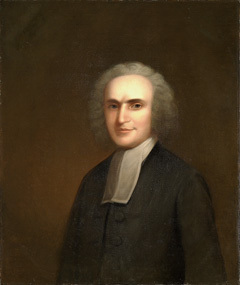 According to the New York Gazette, the president spoke to the graduating class in Latin, reminding them of “manifold Advantages of the liberal Arts and Sciences … rendering them useful Members of Church and State.” Five members of the class became Presbyterian ministers; the sixth, Richard Stockton, became a lawyer and signed the Declaration of Independence. Burr served for three years without salary. He filled the offices of both pastor and president until finally, at the request of the church, he was relieved of his pastoral duties to devote himself full time to the College. He drew up the first entrance requirements, the first course of study, and the first set of rules and regulations; in 1756, he led the move to Princeton, into the College’s first building, Nassau Hall, then the largest stone building in the colonies. President Burr occupied Room 1; his successors still do. Sadly, Aaron Burr Sr. had little opportunity to enjoy the fruits of his endeavors. He died at the age of 41, a year after moving into Nassau Hall. His son, Aaron Burr Jr., graduated from Princeton in 1772 and became the third vice president of the United States.